The Overberg is the region of the Western Cape in South Africa situated at the southern extremity of the African continent. 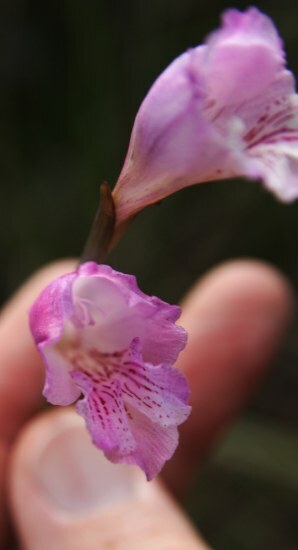 It is bordered by the Hottentots Holland mountains in the west and extends to Cape Infanta at the mouth of the Breede River. 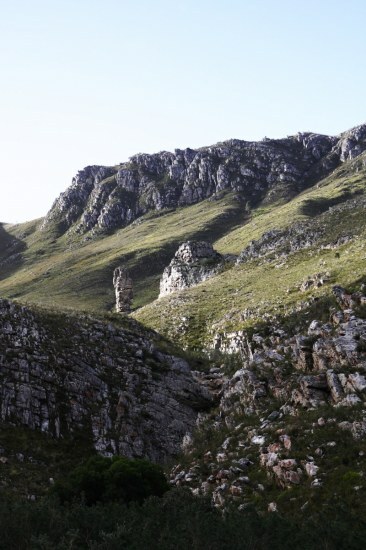 To the north it is bordered by the Riviersonderend and Langeberg mountain ranges and it includes the districts of Caledon, Bredasdorp and Swellendam. It is literally over the mountains, east of Cape Town. The shores are washed by the Indian and Atlantic oceans which meet at Cape Agulhas, the southern most tip of the continent. 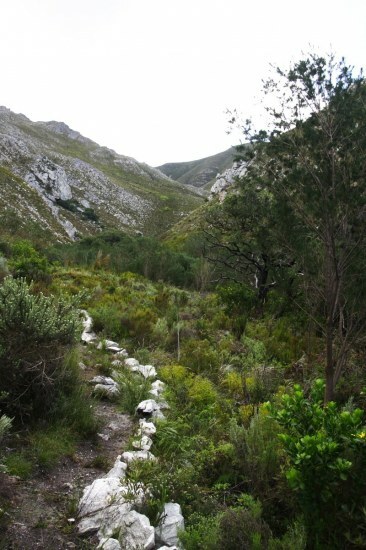 The Overberg has a typical Mediterranean climate with mild, wet, winters and warm to hot, dry summers. Rainfall varies from 300 to 1000 mm per annum depending on the topography with the highest precipitation occurring near the coast and on the south facing mountain slopes. About 20% of the rainfall comes in summer. The mountain ranges consist of ancient Table Mountain Sandstone (quartzites) giving rise to sandy, acid soils low in nutrients. Between the coastal and inland mountains is a wide undulating plain consisting of shale and clay deposits which are fertile and suitable for intensive agriculture. The coastal plain consists of recent marine deposits from which limestone has been formed, resulting in sandy, alkaline soils. 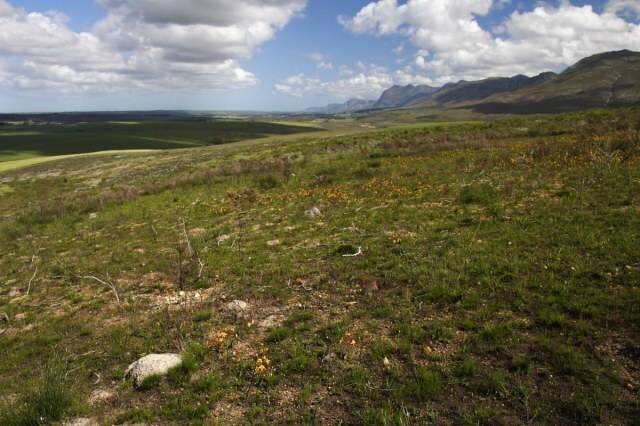 The photo below is on the Overberg coast, looking west from Hawston. The towns of Betty's Bay (at left) and Kleinmond (right) are visible, with the Hottentots-Holland Mountains in the background. Photo by Michael Mace. 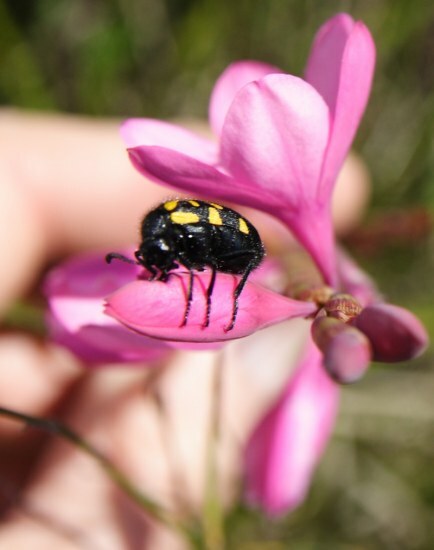 The Overberg is the heart of the Famous Cape Floral Kingdom mainly comprising the well known Fynbos vegetations (fine-leafed shrubland). 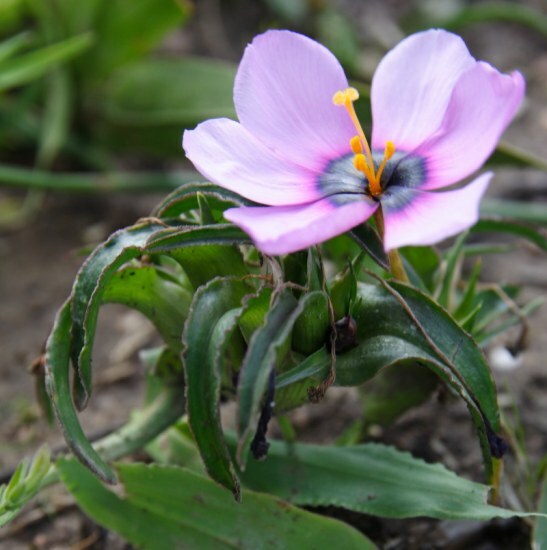 Although it is the smallest of the plant kingdoms in the world, it is the richest with an amazing 9000 species of which about 70% are endemic. 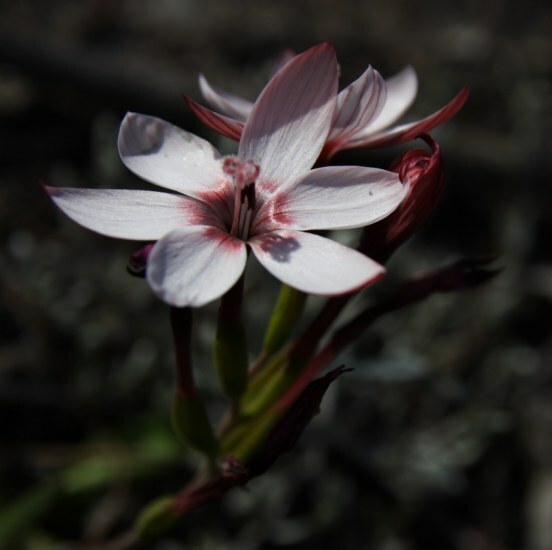 Different types of Fynbos occur in the different habitats - the mountain fynbos being dominated by Proteas, Ericas and Restios. 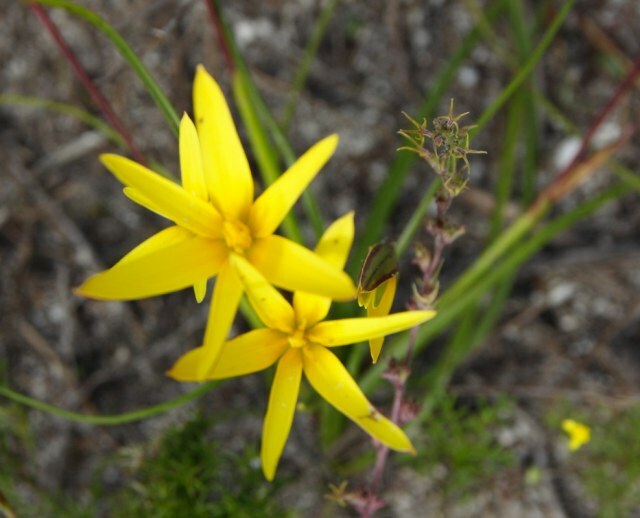 The fynbos vegetation that occurs on the shale and clay soils is called Renosterveld after the dominant species, the Rhinocerus bush (Elytropapus rhinocerotis). 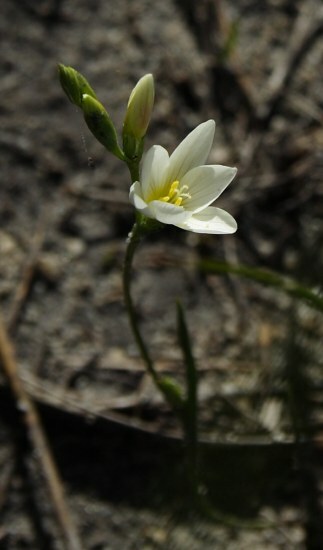 This area is particularly rich in bulbous plants. 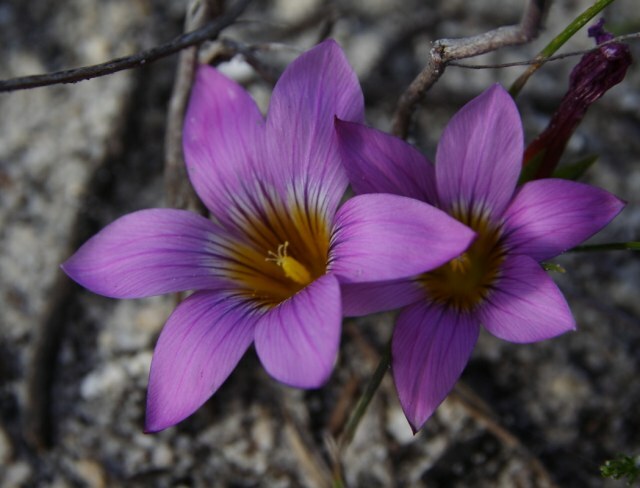 A third distinctive form of fynbos occurs exclusively on the limestone and dune soils of the Agulhas coastal plain. 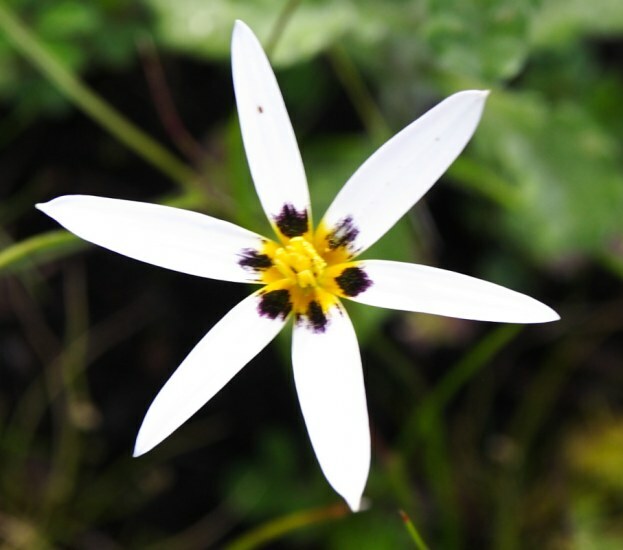 Bulbs occur in all three types of fynbos vegetation, each having a number of distinctive species. 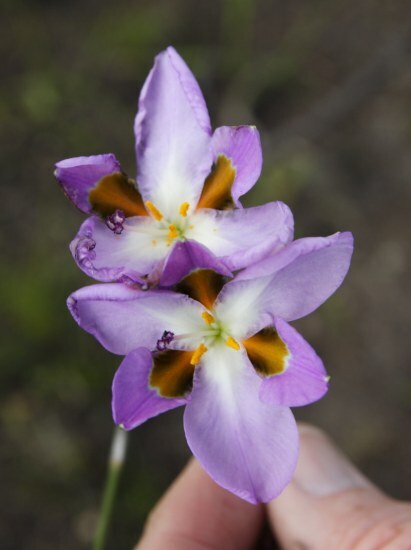 The Iridaceae are the most spectacular with large numbers of Gladiolus, Moraea and other species. 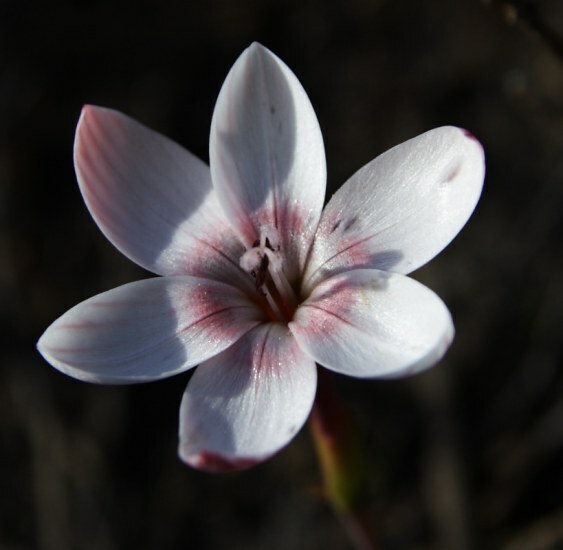 Hyacinthaceae and Amaryllidaceae are well represented with some rare endemics occurring in the region. 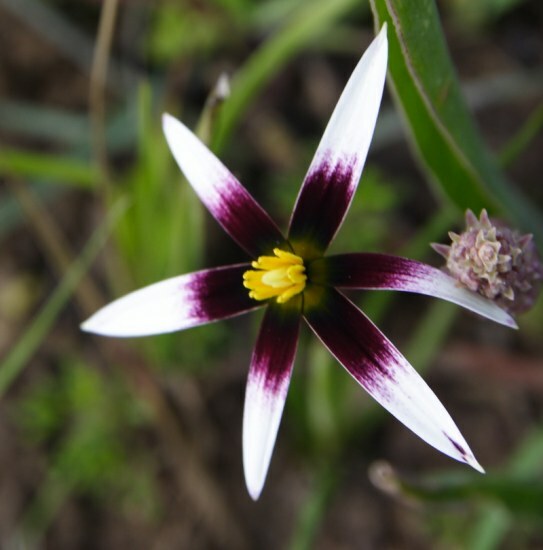 The Renosterveld has the richest and most diverse bulbous flora, but because it has been so extensively cultivated only about 7% of the original vegetation survives and many species are under severe threat. 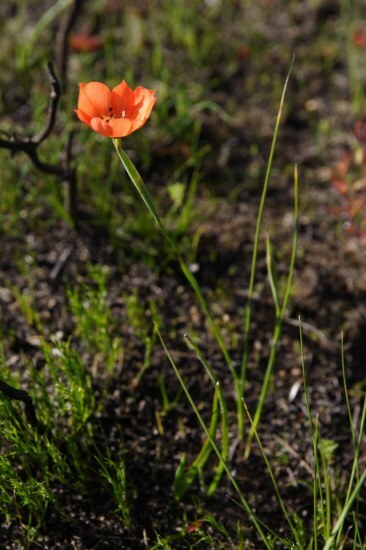 Occasional fires are a natural occurrence in the region and most species are adapted to fire. 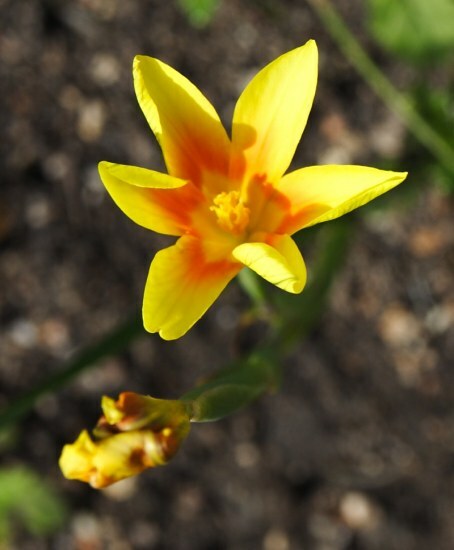 Some bulbous plants, like Lachenalia sergeantii, are dependent on fire to flower. 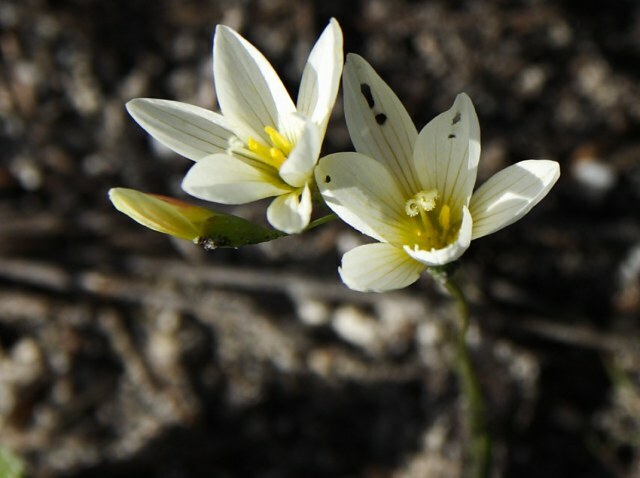 In spring after a fire an amazing explosion of flowering of bulbous plants occurs. 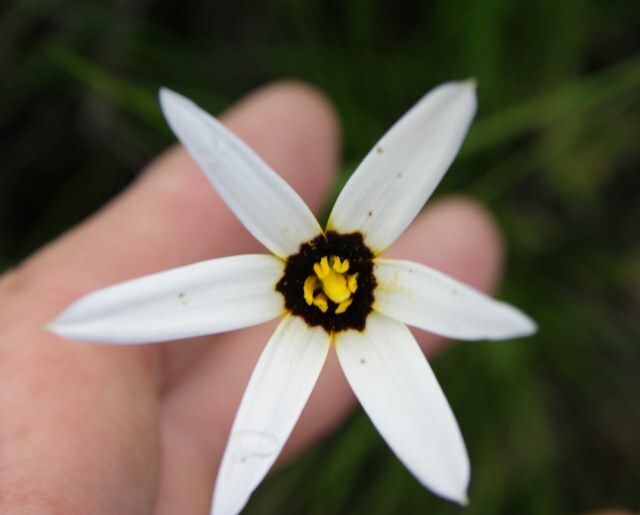 The spread of alien vegetation, especially of Australian acacia species and pines on the mountains, is a very severe threat to the survival of much of the Fynbos and attempts to control its spread have been very ineffective. The information above was furnished by Cameron McMaster. 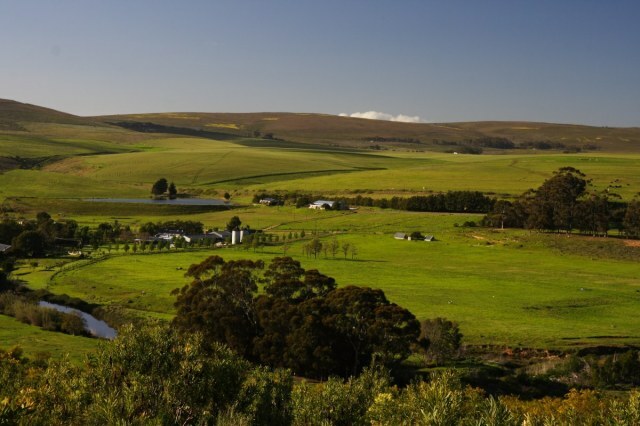 To the eyes of a Californian, the Overberg landscape is both lush and barren: Lush because the countryside is awash with green in the spring, but barren because there is very little native tree cover in the region. The mountains look nearly naked to someone who's used to seeing oaks and sycamores in every moist spot. 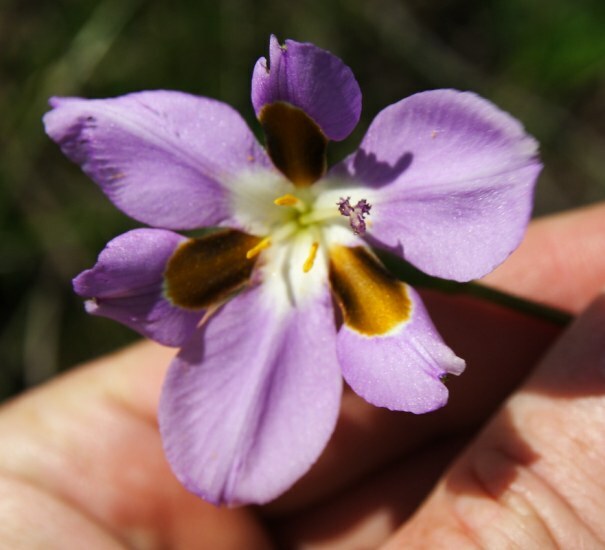 But the plant cover that looks sparse from a distance is incredibly rich up close: an endless tapestry of bushes and bulbs and annual wildflowers. 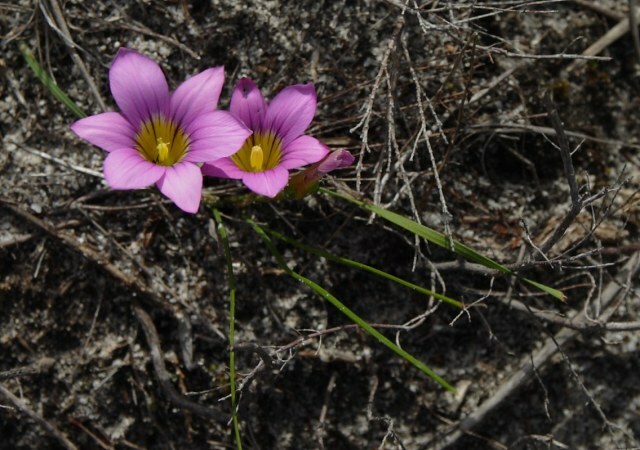 Northeast of the town of Stanford in the Overberg, along highway R326, the sandy fynbos of the Klein River Mountains blends into the rich renosterveld soil of the flats below. 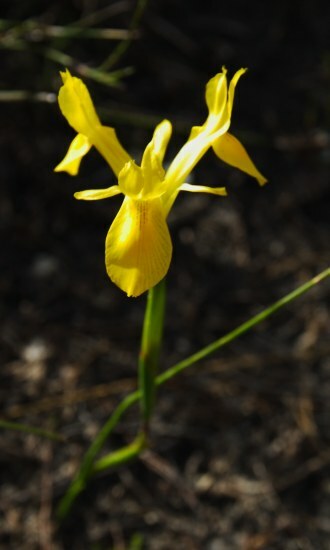 The area hosts a wide variety of bulbs and other plants. 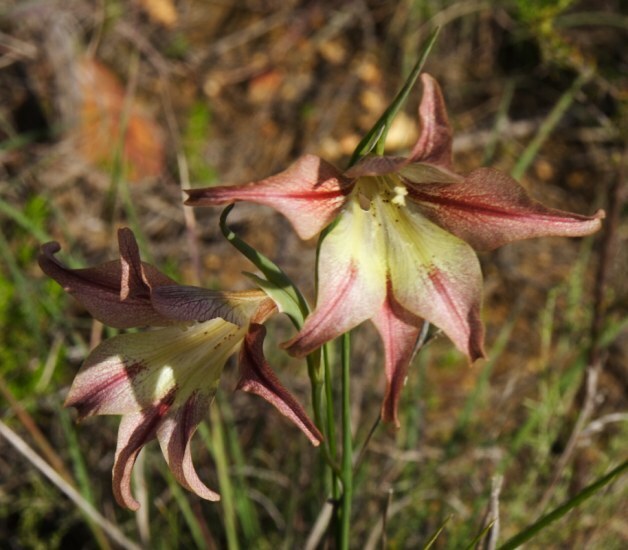 Phillipskop Mountain Reserve is a nature reserve and lodging on the slope of Phillipskop Mountain, run by a botanist and his wife, a conservationist. In the image below, from Google Earth, the mountain is the triangular form at center. 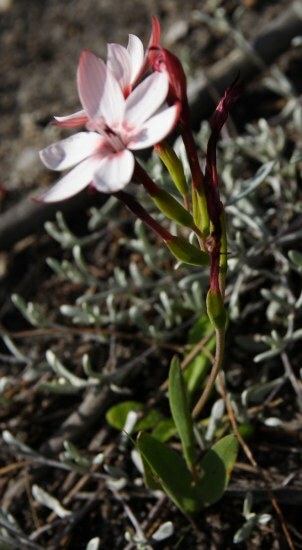 The soil here is mostly quartz sand, and supports stands of proteas, leucadendrons, and other bushes. 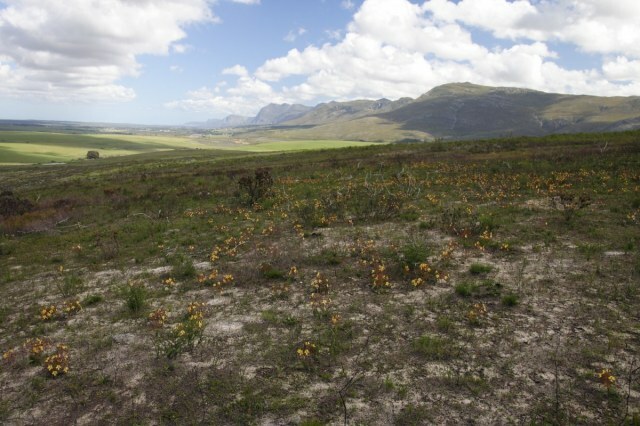 At the bottom of the image, the farmland is on silty renosterveld soil. Some patches of native vegetation have been preserved here by local farmers. 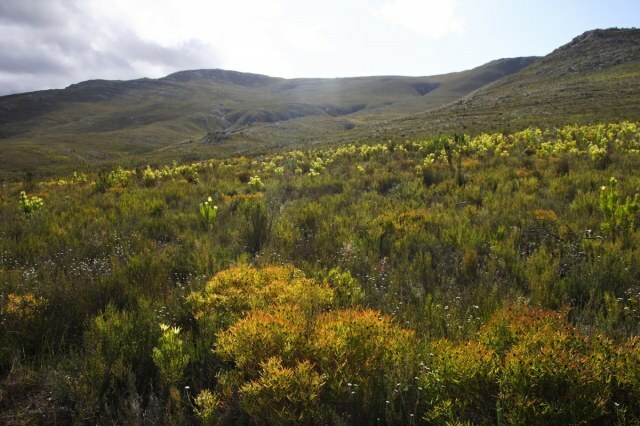 In the first photo below, the shrubs on Phillipskop glow yellow-green when backlit by the sun. Second photo: a path leads to a waterfall. Third photo: the quartz rocks of the mountain look like something out of a Tolkein movie. Fourth photo: The view south from Phillipskop shows mostly farm fields and a dairy. 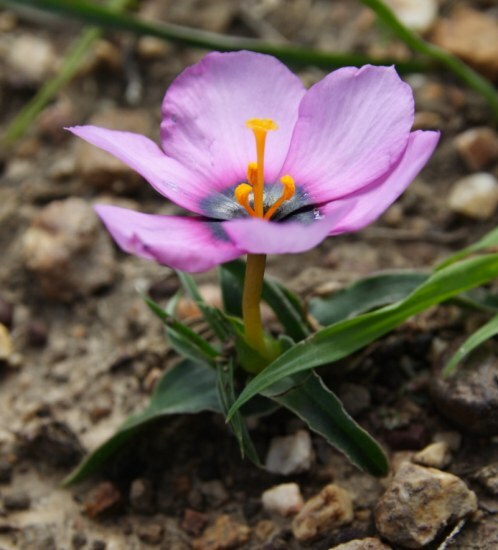 Geissorhiza ovata, a beautiful shell-pink flower that was scattered along a hiking trail. 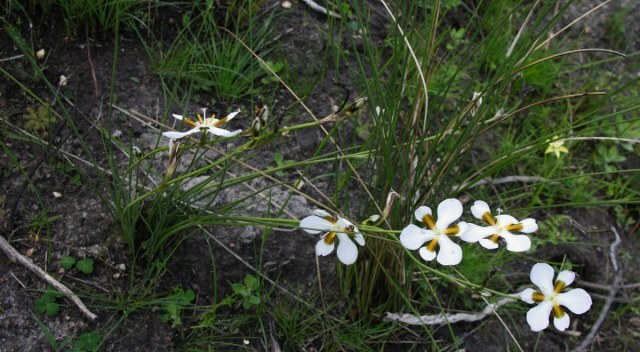 Moraea neglecta, two views of Romulea rosea, a little orange Romulea hirsuta, and two views of a plant that may be Geissorhiza hispidula. 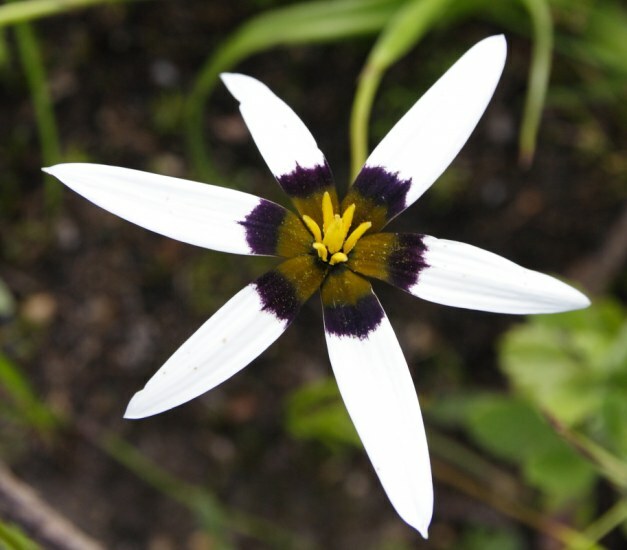 A Pauridia (syn. 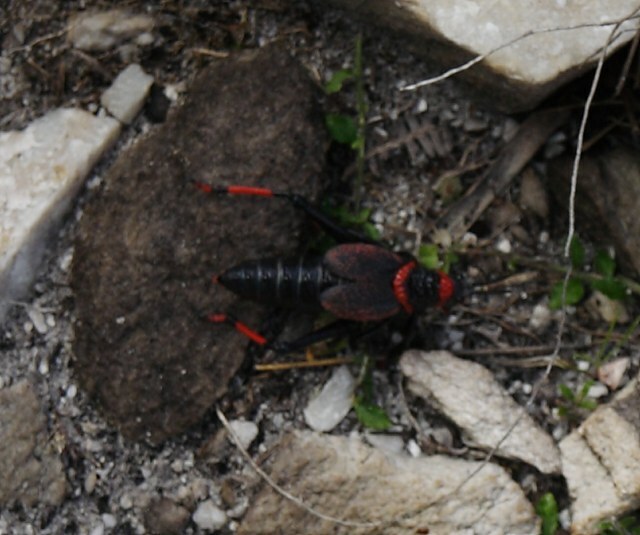 Spiloxene) species, followed by two photos of a Gladiolus (probably G. hirsutus), and a gigantic orange and black grasshopper (just for variety). 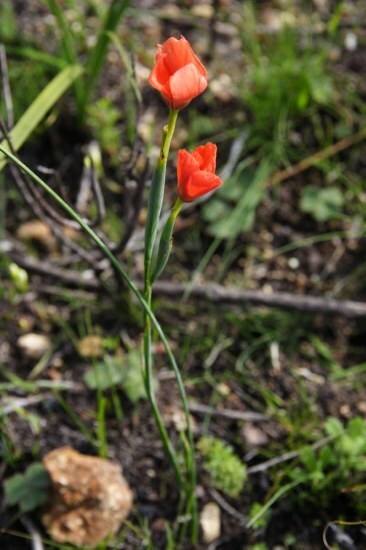 Gladiolus liliaceus, Babiana patersoniae, Watsonia sp, Moraea ochroleuca. 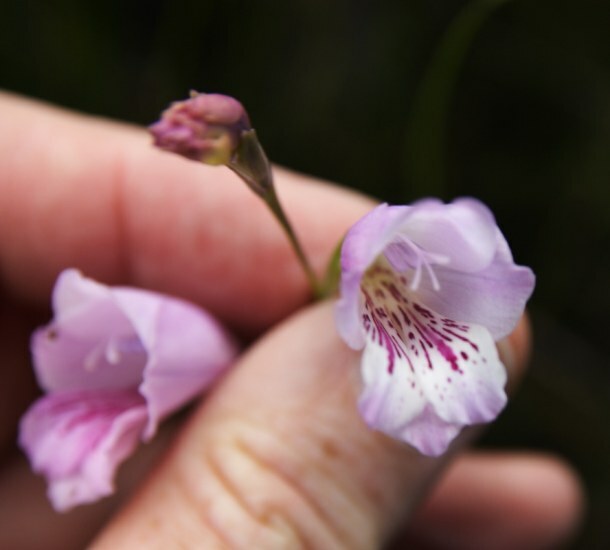 Four views of Pauridia capensis, syn. 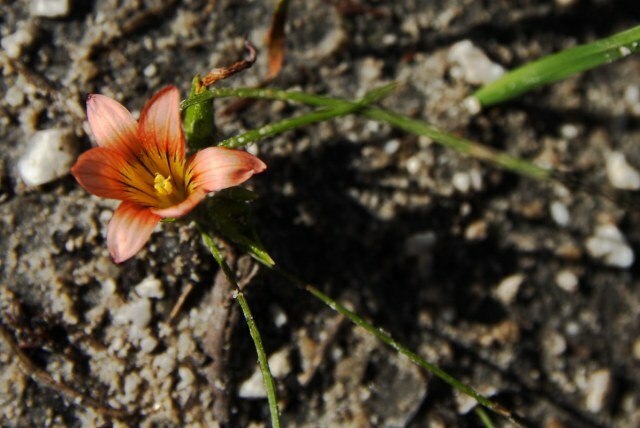 Spiloxene capensis, showing color variations. 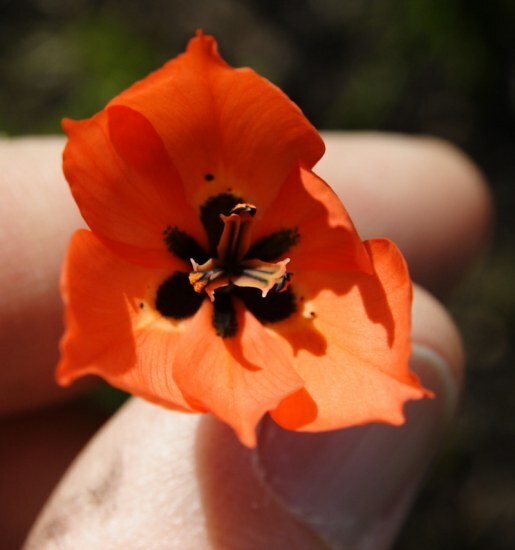 Moraea bellendenii, and a big beetle (perhaps a Pachnoda species?) 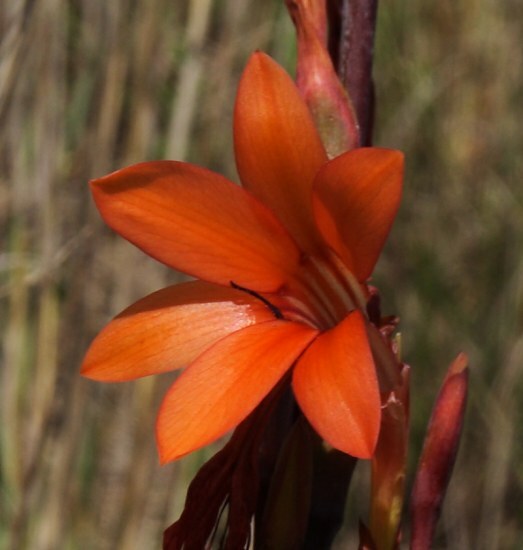 on a Watsonia. 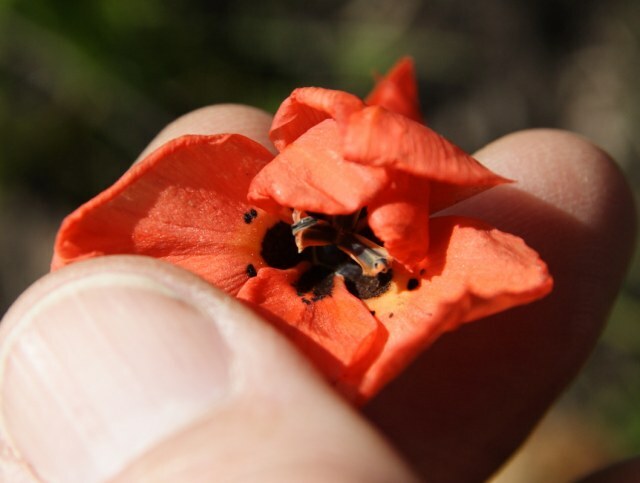 Several views of Wachendorfia paniculata, which has left-handed and right-handed flowers (the style sometimes points right and sometimes left). This is a condition called enantiostyly. Thanks to Phillipskop proprietor (and PBS list member) Chris Whitehouse for explaining this to me. 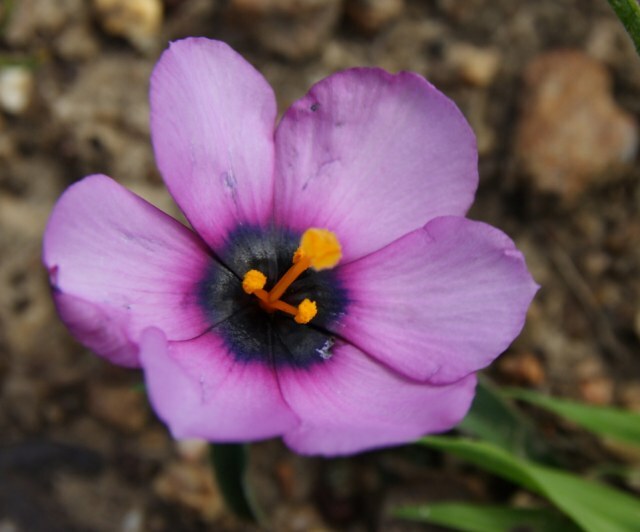 Moraea melanops is a tiny plant with a striking large pink and purple flower. 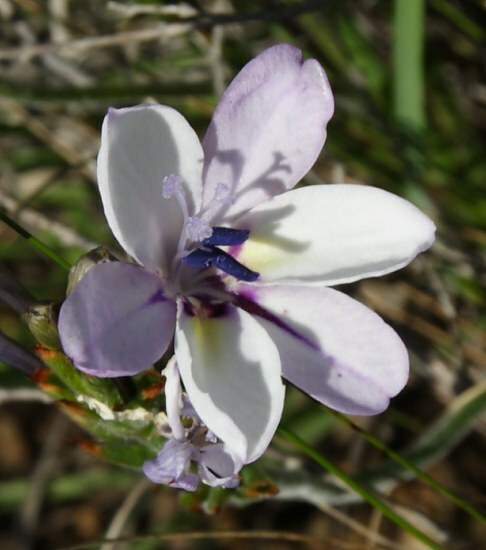 Aristea teretifolia has a big white or violet flower with vivid yellow/brown markings in the center. It was scattered throughout the area. 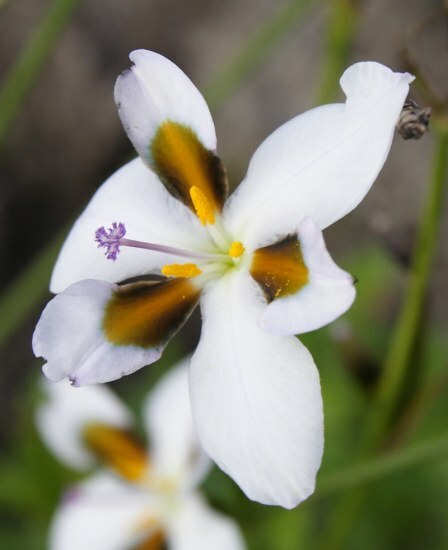 Moraea insolens is a very rare species. This site was the second known location for it. 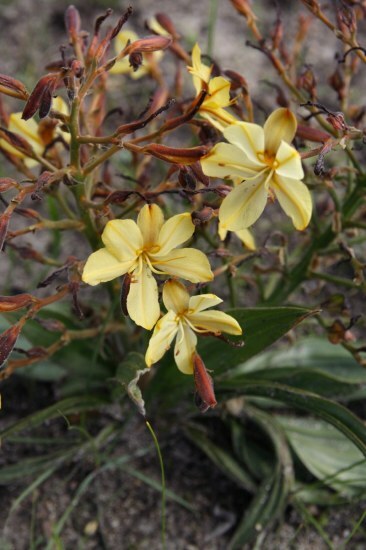 The flowers were scattered at the top of a low rise, in the company of Wachendorfia paniculata. The overlying brush had been burned the previous autumn. A couple of dozen M. insolens plants bloomed here in 2016. 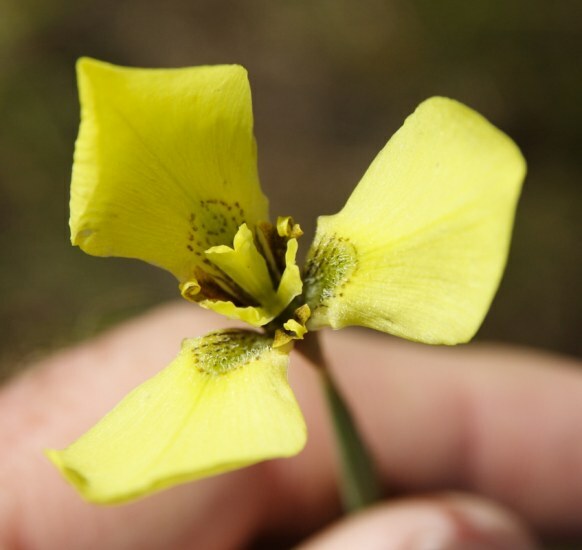 Here are four views of the flowers, followed by a photo of the spot where they grow. Photos and text by Michael Mace.